Time for the Hungry Hippos to chow down. 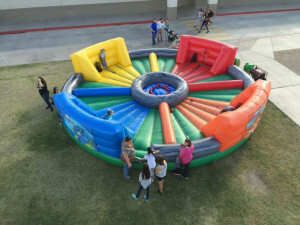 This is the latest interactive inflatable games offered by Laser Sporting / The Bounce House. It is guaranteed to keep everyone laughing for hours. Just like your childhood Hungry Hippo board game, but now you are the Hippo and on a giant 30 foot inflatable. 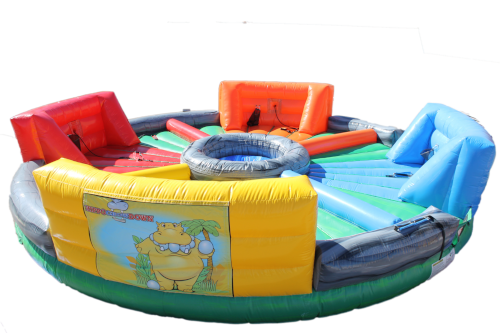 This 4 player game allows each person attached to a bungee cord to race to the pond of balls in the center, retrieve as many balls as possible and return them to a mesh bag. Once all of the balls are consumed, the player with the most balls in their bag is the winner. This is just one of the new and unique inflatable games for kids 8 years and up to enjoy! 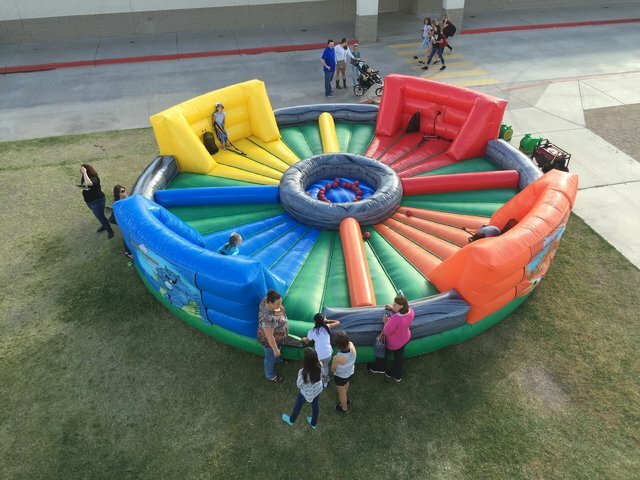 The Hungry Hippo game is great for school and church events. Age suitability: 8 years and up. A Must Add for your Spring fling or Fall Fesrtival!